I have no idea what happened - I was just slow. Very slow. Any time I got anywhere close to target race pace, my heart rate went crazy... and my pace for most of the race was a full minute per kilometer higher than what I had targeted. Something was really, really not right. I'll get back to that in a bit, but first... the race! 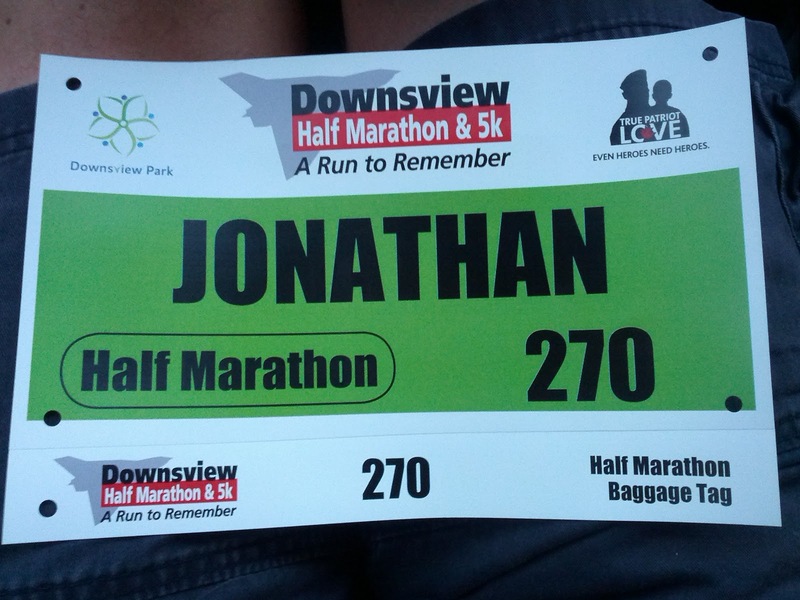 Downsview 1/2 Marathon. First time event, and wow did they draw a great crowd! Almost sold out, and some very nice touches. Race cap instead of shirt - yay! I think we all have enough shirts already... but I really nice running cap is always welcome. 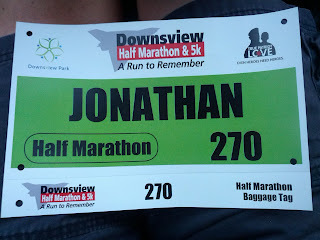 Personalized race bibs (see picture). Usually something you get at big marathons, nice! The aid stations were pretty bad... I hate to rag on volunteers, but there weren't enough of them and they didn't seem to know what they were doing. At the first one, there was no Gatorade/eLoad... at the next one, there was one volunteer giving it out one cup at a time! The guy in front of me grabbed that cup, so I had to help myself from the table... not cool! And the cups I go were so unfilled it would have been comical if it weren't so irritating. I don't really blame the volunteers, they need to be given clear direction on what to do. Bathroom line-ups were brutal! More porta-potties! Or some trees for the men to pee on. Kilometer markers were way off. I think the final distance was right, but if you were relying on the km markers for pace, good luck. 19km sign was at 19.5km, most were off by at least a few hundred meters - and then others were bang-on. A crap-shoot. So a few things they can improve on. All in all it was pretty decent, though, I would do it again. Horrible. Confusing. I have no idea what went so wrong. I started out near my target pace of 4:30-4:35/km. Really early on, I noticed my heart rate was quite high - into the 180bpm range. This is higher than my tempo heart rate normally, so I was a bit confused, but chalked it up to race day nerves or something. But it didn't come down. In fact, it went up. When it hit 185bpm and I was getting to the 6km mark, I knew this just wasn't going to work... I dialed the pace back, but still felt awful. I felt like I was in full blow-up mode at 7km! Crazy. I finally backed waaaaay off, all the way to 5:30/km pace, which is my LSD pace. Still, my heart rate wouldn't go under 170bpm. This was really the story to the end, struggling to keep a 5:30/km pace while my heart rate was something I only ever see on tempo runs. How can I hold 4:28/km over 7km with a heart rate of 168bpm in a training run... but then four days later at the same pace I'm at 185bpm? And had to slow down to 5:30/km to get back into the 170bpm range??? I'm stumped. Maybe I'm coming down with something, I don't know. Just a bad, bad day. Final result was 1:50+, vs my PB of 1:36... I mean it was just crazy bad. Kind of par for the course in 2012 for me, so best to just turn the page and look ahead to 2013! Nice to see you Sunday Jon! My guess would be that the awesome 10K last Sunday may have really drained the tank. Perhaps you regained enough in half a week for the 7K tempo run Wed PM, leaving the tank close to empty again and then regaining enough during a half week taper to go another 7-9K at tempo pace. Regardless, not a good refletion of your fitness, just an off-day. I have the same problem in races: my heart rate is always 15-20 beats faster than the same pace in a training run. Maybe the adrenaline from the race atmosphere?